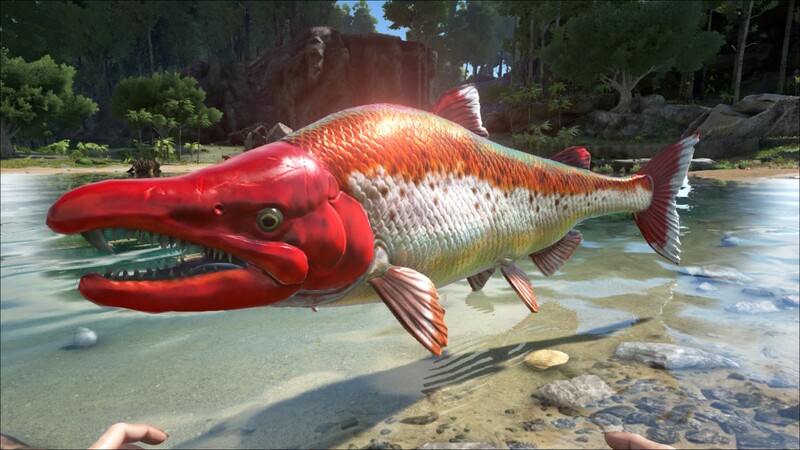 The Sabertooth Salmon or Oncorhynchus is one of the Creatures in ARK: Survival Evolved. Fairly unremarkable by the Island's standards, Oncorhynchus grexlamia is a generally passive fish. Its main form of protection is swimming in a large school. Oncorhynchus does not like conflict, and generally swims away from anything larger than itself at very high speeds. Once provoked, however, Oncorhynchus becomes quite aggressive, along with its nearby brethren. It locks onto its prey with its long "saberteeth" and begins draining that creature's blood. This loss of blood is not too dangerous alone, but when a school of Oncorhynchus attack at once, their target quickly loses speed and stamina from blood loss, drowning if it cannot breath underwater. Like many of the smaller fish found on or around the Island, Oncorhynchus cannot be tamed, but it is often herded and harvested for its resources. In particular, certain cuts of Oncorhynchus meat are considered to have superb quality, and are often referred to as "Prime Fish" used for specific high-end concoctions and taming the Island's many piscivorous creatures. Sabertooth salmon lazily swim about in schools until a player enters the water, which, at that point, they begin to swim away from the player in all directions. However, if one salmon is attacked and still alive, it and its companions will all rush in to attack the player in a vicious frenzy of tooth and fin until they or the player are killed. 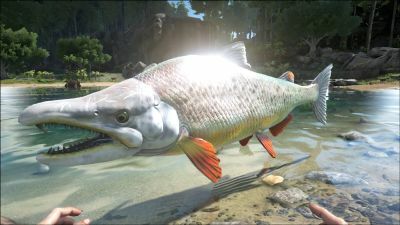 The Sabertooth Salmon is a common fish species in the rivers of the ARK, and thus, a popular prey item for many water-dwelling species on the island. It resembles a modern-day salmon in all aspects save for large fangs protruding from its mouth that give the creature its name. This section displays the Sabertooth Salmon's natural colors and regions. 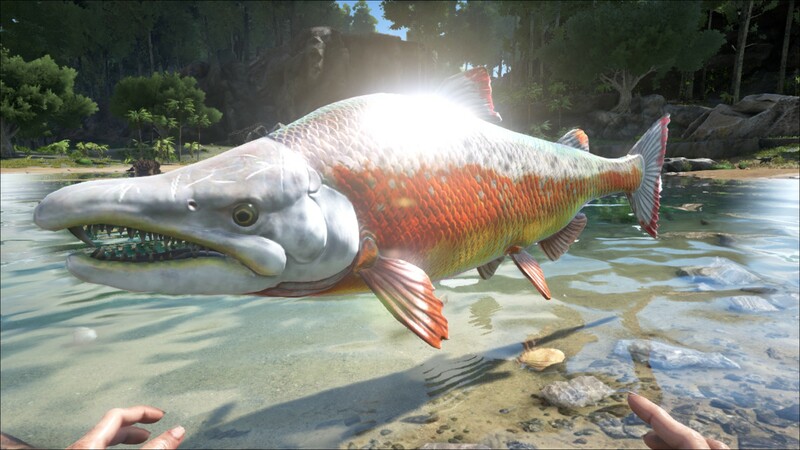 For demonstration, the regions below are colored red over an albino Sabertooth Salmon. The colored squares shown underneath each region's description are the colors that the Sabertooth Salmon will randomly spawn with to provide an overall range of its natural color scheme. Hover your cursor over a color to display its name and ID. For example, "cheat SetTargetDinoColor 0 6" would color the Sabertooth Salmon's "head, upper body/fins, and tail fin" magenta. Use a Sickle to harvest Raw Prime Fish Meat. 5The Sabertooth Salmon is incapable of drowning. Using the (PC), (PS4), (Xbox One), the Sabertooth Salmon bites the target. This section describes how to fight against the Sabertooth Salmon. Sabertooth Salmon very rarely swim alone. Found in groups of 3-4+, provoking one can very quickly become a very bad decision if not prepared. When fighting the salmon it is important to remember that their bleed is a killer, so staying near the shore is a viable strategy. Simply swim far enough to hit the fish with a spear or bow ( or crossbow if available ) then swim back. This will aggro all nearby salmon but they will be easy pickings from the shore with a spear or pike. Long range weapons such as a bow or crossbow can be a cheap and simple way to dispatch of these fish from the shore or shallow bodies of water. Long reaching spears and pikes are also valid options. When attacked, a Sabertooth Salmon will usually flee for a few seconds, but will then come back and attack. Any other Sabertooth Salmon in the area will also become agressive and swarm the attacker. Its bleed effect can be devesating to an unequiped player and can kill quickly. Often limited in health and seems to possess a larger hit box than Piranhas. Sabertooth Salmon can be 'tamed' using Fish Basket . They can level,however they do not eat from the trough. Food Source: Sabertooth Salmon can easily be trapped en masse by use of walls and dinosaur doors, guaranteeing a readily available source of Prime Fish for taming and recipes. The generic name means "hooked nose", referring to the shape of its mouth. The specific epithet roughly means "gregarious swallower", referring to its social nature and ferocity when provoked, but it is incorrectly constructed; the correct form would be gregilamia. Like Coelacanths, they can appear in different sizes. Beyond their fangs, adults of Sabertooth salmon had larger gill rakers compared to their smaller, modern relatives, leading scientists to suggest that the adults ate plankton. Even though Salmon lay eggs in real life it is unknown why the Sabertooth Salmon in Ark don't lay eggs.